Webpage created: July 04, 2017. The Anglican Church of Saint Matthias the Apostle is situated on North Hill, Tavistock Road, Plymouth. In August 1855 a Mrs Anne Watts founded a trust fund for the erection of a church at or near North Hill. She put £8,000 into this fund on the understanding that it was named in memory of her late husband, Mr Matthias Watts. It was some years before the Church was erected in the garden and grounds of North Hill House. The architect was Mr James Hine of Messrs Hine & Odgers of Plymouth. The Church was consecrated by the Bishop of Exeter, Doctor Bickersteth, on October 25th 1887 and the ecclesiastical parish was formed in that year from the neighbouring parishes of Saint Luke, Charles and Christ Church. Saint Matthias is built of limestone in the Perpendicular style. It consist of a chancel, nave, aisles, west and south porches, and a massive embattled tower, 120 feet high, with ornamental tracery and pinnacles of sandstone. It is built of limestone and Portland stone, with yellow Bath stone and red Mansfield stone used in the interior. The sanctuary and chancel walls are panelled in oak and the reredos, designed by Mr G Fellowes Prynne FRIBA and presented in 1891 by an anonymous donor, is richly carved and gilded. The east window is stained and has seven lights. The three chancel windows are also stained and there are two stained windows in the north aisle and one in the south aisle, which contains a side chapel, baptistery, and children's corner. There is a memorial window placed by Councillor Joseph Willoughby in memory of his son, Edgar. The north aisle contains a library corner. It should be noted that this was the only Church in the Three Towns that was not endowed. In 1892 Saint Matthias opened a mission church in Amity Place, Greenbank, which continued in use until 1957. On January 3rd 1912 the foundation stone was laid for the church hall. The site had previously been a bowling green. The Hall was dedicated on September 16th 1912. Almost uniquely, Saint Matthias remained untouched by the Plymouth Blitz in the Second World War, it is said because the church tower was so prominent it became a useful landmark for the enemy bombers. The adjoining parishes of Charles and Saint Augustine, however, did suffer damage and their congregations moved to Saint Matthias. 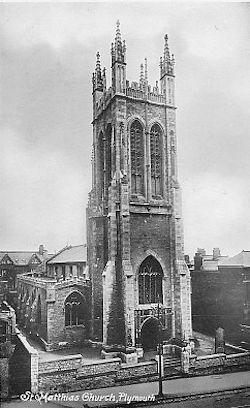 From 1964, when the Anglican Church of Saint Luke in Tavistock Place closed down, the parish has been known as Charles-with-Saint Matthias and the vicar is responsible for any services still held within the ruins of Charles Church. In 1966 the Great War Memorial from Saint Luke's Church was removed to Saint Matthias.